Acclaimed for his sculptures, installations, and public artworks that investigate the relationship of the body to space, British artist Antony Gormley is also an accomplished draftsman. Drawing is a core part of Gormley’s practice, ranging from studies for sculptures to individual works on their own. Drawing Space is the first U.S. museum exhibition to present Gormley’s works on paper, bringing together approximately 80 prints and drawings created over 40 years. Often made at night, they employ unusual materials such as blood, earth, casein, and bleach, and fluctuate between figural and abstract shapes. Although mostly created using his own body, Gormley’s figures address collective experience and memory. The exhibition also includes two recent sculptures, emphasizing the intrinsic link between the artist’s sculptural practice and the act of drawing. Gormley’s most direct engagement with the human form appears in early drawings such as Mansion (1982) and the Body and Light series (1990–95), which capture floating figures immersed in space. The body is also the focal point in the Body and Soul etchings (1990), but as fragments: hands, eyes, mouth, nose, knees, and spine. Created with imprints of the artist’s body placed against stark black or white backgrounds, these works highlight the coexistence of opposites: light and dark, positive and negative, subjective and objective. 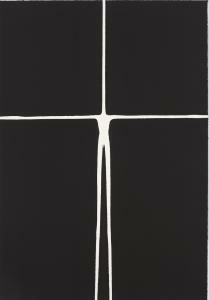 A more abstract approach is evident in the large-scale lithographs Bodies in Space (2007), in which figures dissolve into black and white drips. In the Clearing drawings (2005–09), the body gives way to looping lines that form whirling abstract shapes or energy fields. In the monumental Breathing Room XXIV (2010), angular web-like structures unfold into the limitless depth of space. The interconnection between Gormley’s sculpture and drawing becomes clear in the linear quality of the two steel structuresClasp II (2010) and Aperture XIII (2010), underscoring the artist’s attempt to explore both the body and space. This exhibition includes three prints published by World House Editions - Space, Bodies in Space (black) and Bodies in Space (white) all from 2007.